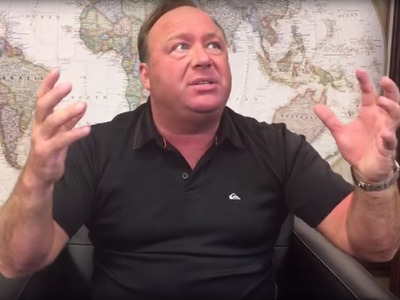 It’s easy to find conspiracy-theory videos by the Infowars host Alex Jones and David Icke on Amazon’s video service. Amazon is charging viewers money to watch conspiracy content through its Prime subscription service or as individual rentals, and it doesn’t have any warning labels for the videos. It’s surprisingly easy to find films on Amazon Prime suggesting that President Barack Obama was a puppet or that the world is being taken over by a reptilian alien species. Jones is particularly notorious for claiming that the London 7/7 bombings and the Sandy Hook school shooting were “staged.”The parents of the Sandy Hook victims are suing him. A quick search on Amazon’s video service brings up Jones’ 2009 film “The Obama Deception” and other titles, available either to rent from £3.50 ($US4.60) or free for anyone who pays £79 a year to access Amazon’s Prime subscription service. Icke is a British former BBC sports presenter. He’s also a Holocaust denier and promotes the idea that the world has been taken over by a reptilian alien species. While companies such as YouTube have argued they don’t want to police speech and user-generated content, Amazon will struggle to make the same case, given it charges people to watch videos either through rentals or through Prime.